Meowth: The time has now come. The first episode of the new Cosmic Quest is complete and ready to be published. Jessie: Once this update hits the internet, we control our own destiny, and we will become unstoppable. James: I could cry, I’m so happy right now. This is truly our crowning achievement. Meowth: Before we get to that though, we have one other piece of business to attend to. All day we’ve been running a poll to see which of us is the favorite of you, the readers, and the results are in. Can I get a drum roll please? Meowth: Out of eight votes, four went to James, and four went to me, Meowth! James: *cries* They like me! they really like me! Meowth: Of course I won, I’m the top cat. Jessie: … …Wait a second! If you both got four votes, and there was only eight, that means that no one voted for me! What is this!? In what world does no one vote for me!? I am obviously the greatest Team Rocket operative to ever live! Meowth: Keep telling yourself that. Meowth: Nothing, nothing at all. Jessie: That’s what I thought. Whatever, this poll was clearly rigged. Let’s just post that chapter. Meowth: Alright, everything’s ready for the upload. Once I press this button, everything changes for the better. Let’s press it slowly and savor the moment. James: I’m so excited. I can already feel the power washing over me. Jessie: With this update, we’ll finally get what’s coming to us. Yuni Oha: That you will, Team Rocket! Dracosmic, use Draco Meteor! Jessie, James, and Meowth: WHAT!?!?!?!?!? AHHHHHH!!!!!!!!!! Ash: Pikachu, use Volt Tackle! Jessie, James, and Meowth: Not the Twerp too! Pikachu: Pika pika pika pika pika pika pika chu! Jesie, James, and Meowth: NOOOOOOO!!!!! Yuni Oha: Shall we finish this together? Yuni and Ash: Attack now! Jessie, James, and Meowth: Looks like Team Rocket’s blasting off again! Yuni Oha: Whew, got them out of the way just in the nick of time. Ash: Yeah, much longer and we wouldn’t have had a chance at stopping them. Description: The larger points of light on Dracosmic’s scales align perfectly with the stars in the constellation Draco, leading historians to speculate that it was the ancients’ basis for the constellation. 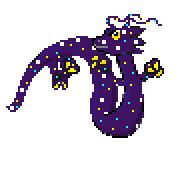 Dracosmic have the ability to float, and will often be found flying during the night, when their bodies blend in with the starry sky, but people rarely realize what they’re seeing. Evolves from Serpenstar at level 50 at night. I’ve also completed Ryu’s Character Guide section and added a new section to the New Mechanics page dealing with Signature Moves. Check them out.